You know them well. They may have been in your crowd growing up or in your neighborhood. You surely saw them in action at school or college. Oh noooo, you may have even noticed a bully or two at work. Corporate bullies come in all shapes, sizes and flavors. They could be a co-worker, a manager, your manager's boss or somewhere up the food chain. When I grew up in the Edenwald housing projects in New York City I had a fight every day and never won any. Most of the fights were with bullies. My father gave me good advice. He said "fight like mad with all available weapons of opportunity. If a bully has to work to win a fight, they won't bother you again. They don't want to work that hard". My father was right. I hit them with everything and anything, when plain fists just woudn't do. All of them became my friend or at least gave me big respect enough not to bother me, after each fight. After awhile, I had made so many friends I didn't have to fight anymore. I made allies out of the bullies. Over the years I have manuevered around corporate environments with the same type of attitude. There's no physical fighting and the weapons have changed. I became and continue to be a student in the use of the weapons called education, words, human nature and tactical strategy. Reading Leadership Secrets of Attila the Hun and Sun Tzu Was a Sissy... has helped a little too. Bullies mask their cowardice with various tactics. They may use intimidation, monoplozing meetings, not letting anyone else talk, taking all the credit for team projects, or even blatant threats, winning favor by ratting on others to the boss. Managing bullies love to use loss of a job as the ultimate tool. Eliminate the fear of this tool, by creating a secondary income. That's what "Savvy Intrapreneurs" do. A secondary income also allows you to tell your boss what she/he needs to know, not what you think they want to hear. This also means you will be more effective at performing your job. Set a goal of making your secondary income match your take home pay. Find out what or who in the organization makes the bully afraid. Use this to your advantage. Notice the situations or make friends with the person that makes the bully cringe with fear. Everyone is afraid of something, unless they are mentally disturbed. Learn to pick your fights with bullies. Standing up to bullies will make your star rise faster. You may not win all the time, but they will respect you. So will people under you, around you and above you in the corprate food chain. Add the tools above to your "fast track" management program. 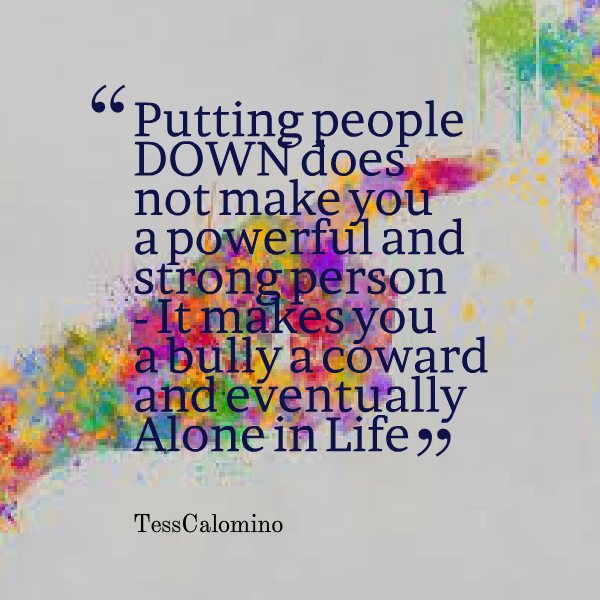 Bullies are nothing more than insecure, hollow cowards who constantly seek attention. Smacking them back as hard or harder, without lifing a finger to physically touch them, is the secret to putting them in check. Everything you said is simply not true. Bullies are simply peopel with physical strength that far exceeds others, and they enjoy demonstarting it. Because you like violence, it doesn't mena you are insecure or that you suffer from various drawbacks. It certainly doesn't mean that you are a coward either, in fact, the bully is anything BUT a coward. The real cowards are the victims. 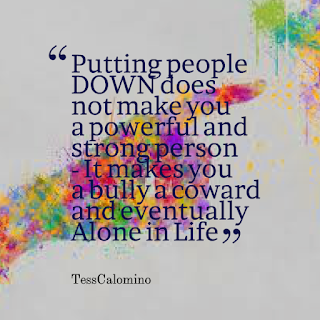 if bullies are not cowards why dont they pick bigger "victims"